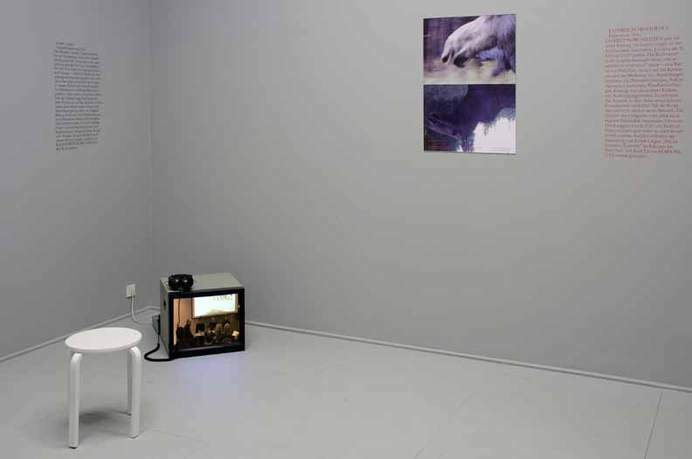 View of "Zak Kyes Working With...", 2011, Galerie für Zeitgenössische Kunst Leipzig, Germany. The Museum of Contemporary Art Leipzig (Galerie fur Zeitgenoessische Kunst Leipzig) presents the first solo exhibition in Germany by the Swiss-American graphic designer Zak Kyes. In collaboration with the curator, Barbara Steiner, the exhibition brings together a range of works by Kyes, as well as new ones by a host of collaborators that include architects, artists, writers, curators, editors, and graphic designers, presenting contemporary graphic design as a practice that mediates and is mediated by its allied disciplines. Zak Kyes is a Swiss-American graphic designer. Kyes formed the design studio Z. A. K. in 2005 and joined the Architectural Association, London, as art director in September 2006. In 2008, he cofounded Bedford Press, an imprint of AA Publications. 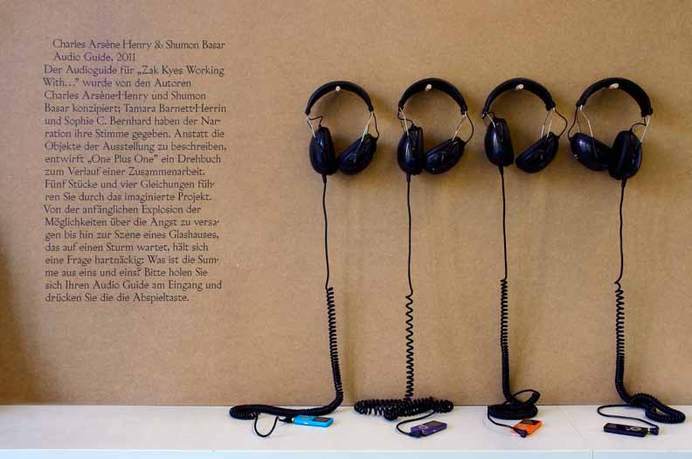 The studio has been awarded the Inform Award for Conceptual Design in 2011 and was twice awarded the prize for the Most Beautiful Swiss Book in 2010. 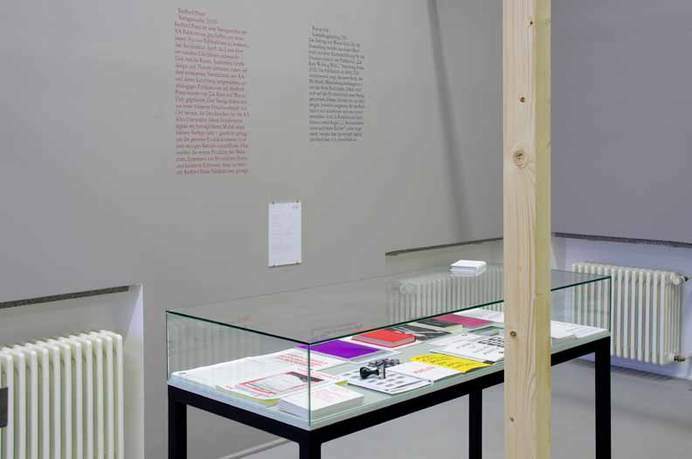 The studio's work has been included in the exhibitions Graphic Design Worlds (Triennale Design Museum, Milan, 2011), Wide White Space (CCA Wattis, San Francisco, 2011), The Malady of Writing (MACBA, Barcelona, 2009), Graphic Design for and Against Cities (Corner College, Zurich, 2009), Dubai Duesseldorf (Kunstverein fuer die Rheinlande und Westfalen, Duesseldorf, 2009) and the 22nd International Biennale of Graphic Design (Brno, 2009). Apart from studio projects, Kyes's critical practice encompasses publishing, curating, and site-specific projects for and with art institutions. 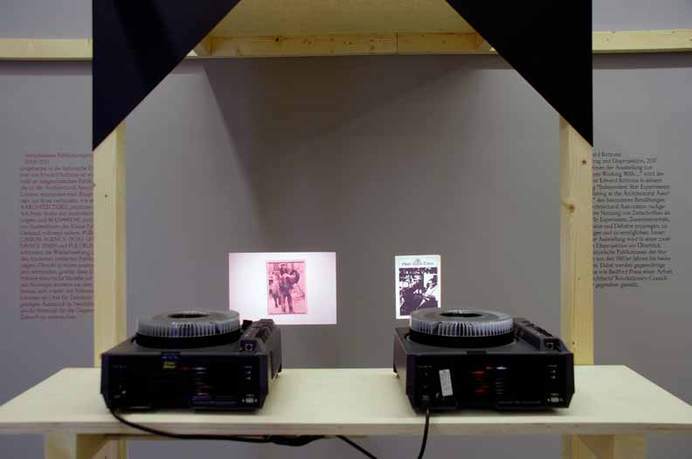 His work engages with publications and their dissemination as sites for debate and exchange rather than documentation. He currently teaches at the Architectural Association School of Architecture, London, and in the MA program at ECAL (Ecole Cantonale d'Art de Lausanne). Can Altay was born in Ankara in 1975. He earned his BFA in 1997 from the Institute of Art and Design, Department of Interior Architecture and Environmental Design, Bilkent University, Ankara, and earned his MFA and PhD from the same institution in 1999 and 2004, respectively. He also completed a year-long critical studies post-graduate program at the Malmo Art Academy, Lund University, Rooseum Centre for Contemporary Art, Sweden. Charles Arsene-Henry is a writer and editor. He is the founder of White Box Black Box, a speculative agency enquiring in the different formats of research and fiction. 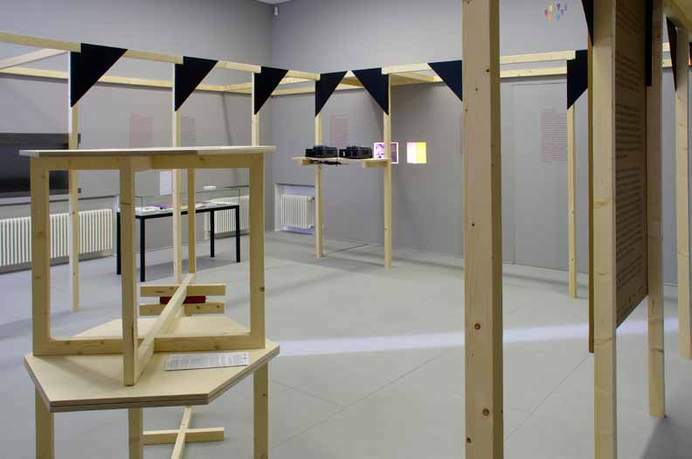 In 2010 he cocurated the exhibition Translated By at the Architectural Association, London. He is conceiving a text-laboratory with the Luma Foundation called The Library is on Fire. He has been reading French fiction for Faber and Faber since 2006. Shumon Basar is writing a novel entitled World!World!World!. He has coedited the books Cities from Zero; With/Without; Did Someone Say Participate? ; Hans Ulrich Obrist: Interviews, Volume 2; and is a contributing editor at Bidoun and Tank magazines, as well as cofounder of sexymachinery. He collaborated with Eyal Weizman and Jane and Louise Wilson on a film entitled Face Scripting which debuted at the 2011 Sharjah Biennial. At the AA School, London, he directs the Cultural Program, where he cocurated the audio exhibition Translated By, and launched the new live magazine Format: The Shapes of Discourse. Edward Bottoms is the archivist at the Architectural Association archives. He has written on a wid- range of subjects including Georgian portraiture; collecting and patronage on the early Grand Tour; and nineteenth-century architectural cast museums. His work on the collections of the AA archives has resulted in articles on the Royal Architectural Museum; Anglo-Swedish architectural exchanges in the interwar period; and student initiated magazines, journals, and periodicals. The AA archives house a substantial collection of material relating to the social and intellectual history of architectural education, dating back to the AA's origins in the 1840s. Its holdings include a wealth of student drawings, models, posters, and ephemera, together with the AA's educational and administrative records. The archives aim to highlight the significant role played by architecture schools in the formation, propagation, and transmission of architectural culture, theory, and practice. Wayne Daly is a graphic designer at the Architectural Association Print Studio, London. Daly studied at Institiúid Teicneolaíochta Phort Láirge and the London College of Printing. Since then he has worked predominantly on books and independent publications. He recently established Precinct, a micropress which publishes books in collaboration with artists and writers, including a recent essay by Adam Harper on the work of American musician John Maus. Daly has participated in various exhibitions and publishing fairs in cities including London, New York, Berlin, Athens, Barcelona, Paris, Zürich, Stockholm, and Dublin. He has written for the New Zealand-based journal the National Grid and has lectured at LCC, Werkplaats Typografie, and the American University of Beirut. He founded Bedford Press at the AA with Zak Kyes in summer 2008. Jesko Fezer is a Berlin-based architect and professor for experimental design at the University of Fine Arts Hamburg. In cooperation with the IFAU he realized architecture projects in Munich, Stuttgart, Berlin, Utrecht, Graz, New York, and London. He is cofounder of the thematic bookshop Pro qm and coeditor of the political architecture magazine An Architektur. Having taught at various universities, he was most recently heading the research program Civic City: Design for the Post-Neoliberal City at the Institute for Designresearch Zürich (ZHdK). Fezer is active as curator, artist, and exhibition designer (Kooperative für Darstellungspolitik), and he publishes on post-war architectural history, design methodology, participation, and process-based urbanism. Joseph Grigely is an American artist and critical theorist. As an artist, his work explores issues of communication, and ways language is reshaped by human contexts. As a theorist, his work has focused on the field of textual criticism, and the ways art is unmade and remade in the course of its dissemination in culture. His publications include Textualterity: Art, Theory, and Textual Criticism (1995), Exhibition Prosthetics (2010), and the forthcoming Textualterity 2. Grigely has a DPhil from Oxford University and is professor of visual and critical studies at the School of the Art Institute of Chicago. Nikolaus Hirsch is a Frankfurt-based architect, and director of Städelschule and Portikus since 2010. He has held academic positions at the Architectural Association in London, the Institute for Applied Theatre Studies at Gießen University, and the University of Pennsylvania. His work includes the acclaimed Dresden Synagogue, Hinzert Document Center, Bockenheimer Depot Theater (with William Forsythe), unitednationsplaza (with Anton Vidokle), European Kunsthalle, and numerous exhibitions structures such as Bruno Latour´s Making Things Public (ZKM) and Indian Highway (Serpentine Gallery). Current projects are a studio structure for Rirkrit Tiravanija´s The Land and the Cybermohalla Hub in Delhi, a hybrid between school, community center, and gallery that involves seventy young practitioners engaging their urban context through various media. 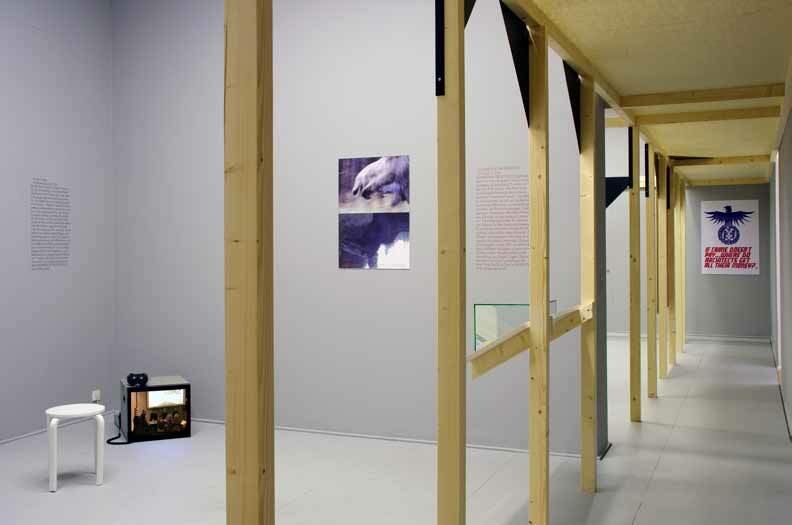 Hirsch has curated ErsatzStadt: Representations of the Urban at Volksbühne Berlin (2005), Cultural Agencies in Istanbul (2009–10) and Time/Bank at the Portikus (2011). He is the author of the books On Boundaries, Track 17, and Institution Building. Michel Müller is professor at the Cologne Institute for Architecture and Design, and he has previously held academic positions at the State Academy for Art and Design Stuttgart, and the Hochschule für Gestaltung Karlsruhe. In 2004 he earned his doctorate with a dissertation on the planning methods of convertible architecture. His work includes the Power Station Darmstadt, the Machine Hall Darmstadt, and numerous exhibition architectures such as Making Things Public at the ZKM (curated by Bruno Latour and Peter Weibel), Frequencies-Hz at Schirn Kunsthalle; and Indian Highway at the Serpentine Gallery, London. Müller´s ongoing research on institutional models has resulted in projects such as the Bockenheimer Depot Theater (with William Forsythe), unitednationsplaza in Berlin (with Anton Vidokle), Cybermohalla Hub in Delhi, and currently, a studio structure for Rirkrit Tiravanija´s The Land and a temporary living structure for homeless people in Frankfurt am Main. Radim Peško is a designer currently living in Amsterdam, the Netherlands. His work focuses on typography as an intersection of technologies and language, type design, and occasional exhibition projects. In 2010, he established his own digital foundry (http://www.radimpesko.com), which specializes on typefaces that are both formally and conceptually distinctive. He is a regular contributor to various publications including Dot Dot Dot magazine, and collaborates with artist Katerina Šedá on her artistic projects. He currently teaches at Rietveld Academie in Amsterdam. Barbara Steiner has been the director and curator of the Stiftung Galerie fuer Zeitgenoessische Kunst Leipzig (GfZK) since 2001. As a curator and writer, her work focuses on the politics of representation (institutional critique, architecture, and display) and the critique of economics in the realm of art exhibition and museum practice. 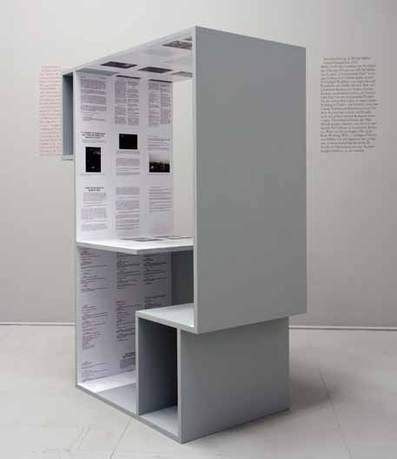 Steiner studied art history and political science at the University of Vienna, completing her PhD with a thesis on the ideology of the white cube. Since 2003, Steiner has initiated a number of research projects on conditions of art production in post-Communist countries, on the legacy of modernism, and on the politics of memory. The Museum of Contemporary Art, established as a foundation in 2005 based in Leipzig, is an exhibition space for contemporary art and a museum for art, post-1945. The foundation is supported by the Free State of Saxony, the city of Leipzig, and the Friends Organization of the GfZK. The GfZK promotes and imparts international and national artistic positions on its own premises and in public spaces. Temporary exhibitions by artists of the younger generation as well as important art historical positions of the last decades are showcased in both a Wilhelminian villa—remodeled between 1995–98 by the Dresden architect Peter Kulka—and a building opened in 2004 by as-if berlinwien. Since 2007, the permanent collection has been presented as a series of changing exhibitions. Alongside its collection and exhibitions, GfZK boasts a publicly accessible library, long-term research projects, grants for young Saxon and international artists, and mediation programs for children, young people, and adults.